Parents are advised strongly to make sure that all of their children's clothing is clearly marked with their child's name. 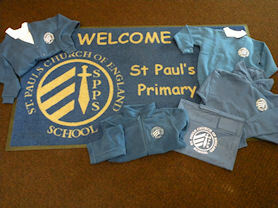 St. Paul's logo cardigans and v-neck sweatshirts are available to purchase from the school office. In the summer months the girls may wear light blue gingham summer dresses. Girls should not wear colourful socks or tights but are expected to wear only white or black socks or grey or black tights.